Photography by Moonlight - Scenes in a Different Light. "Scenes in a Different Light"
Photography by moonlight can give images a mystical effect which you are unlikely to capture under any other lighting conditions. I have just found your site tonight. Do you have anything on taking moonlight photos. Not necessarily pictures of the moon but nice moonlight scenes? I do not have a section on night photography yet but I'll add it to the list of "things to do". Meanwhile, in my experience I have found that the most difficult thing to get right is exposure - it's usually down to trial and error although the number of trials reduce with experience. Set your camera up on a tripod or at least on a very firm base - the longer shutter speeds involved in night photography rule "hand held" out of the question. Switch your camera to flash "off", manual exposure and manual focus - this is very important as any "automatic" exposure setting will give you a very light image and the camera will have difficulty focusing itself in the dark. If you are using a digital camera - switch noise reduction "on" if you are using a camera which has this function and unless you are shooting in RAW, set the white balance to "daylight" (or "tungsten" if you want a "bluer" result). Once you have positioned the camera for the composition you want, try setting the exposure to 2 seconds at f5.6. (vary these according to the depth of field you want to achieve - I am assuming you are knowledgeable about depth of field although there is an explanation on the Focus page. Focus the camera manually - 10 metres will give a good depth of field at f5.6 for a 50mm lens (35 mm format equivalent). When you have taken the image, preview it and adjust the shutter speed for your next "trial" - longer exposure if the trial image is too dark, shorter if too light. If your camera enables you to study the histogram for the shot, most of the pixels for a "good" moonlit shot will be towards the left hand end of the scale but not too many at complete black. Let me know if any of this is unclear or if you need more information - I'll help if I can. Thanks for taking the time to give me such a detailed reply. I have just tried getting these kinda shots. 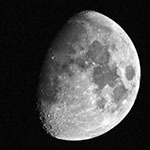 Return from Photography by Moonlight to the Photography Tips page.